In 1977, the GasketGazette published a series of articles detailing the race tracks in Midwest Division, SCCA. Bill Brollier provided detaile maps, and George England gave commentary on how to drive the track, where to eat, sleep, party and other details. The first one is Stuttgart, Arkansas. The first "Grand Prarie Grand Prix" was held in 1959. The last race was believed to be in 1978. Race courses-as people-have personalities. 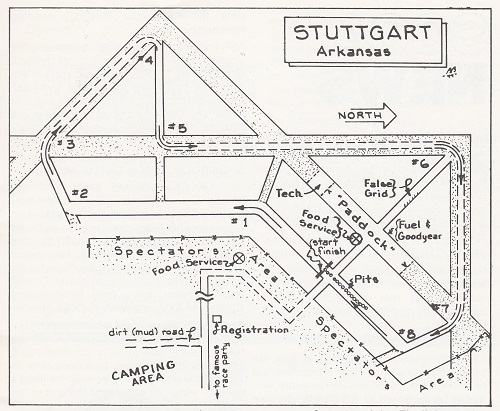 One of our senior racing sites, Stuttgart, Arkansas, always draws a crowd of spectators and drivers alike, due in no small part to its particular charisma. When you first visit that Eastern Arkansas metropolis you find a typical flat airport course amidst the rice paddies, 5 miles north of the rice capital of the U.S., which in turn is a rather dreary-looking small town with limited facilities for eating, sleeping, reveling or whatever. Chances are it is raining when you arrive, if not, you can bet it will rain before the weekend is over and you most certainly will meet those notorious rice paddy mosquitoes! Chances are you say to yourself, "Never again." 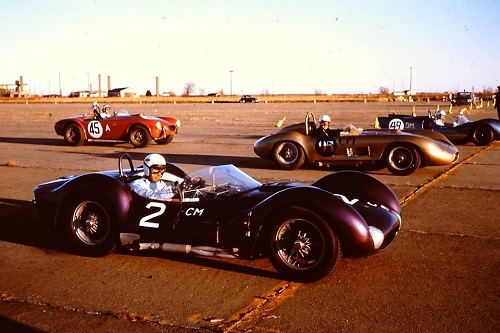 But chances are just as good that you'll be back year after year to participate in the Grand Prairie Grand Prix, where Bob Alyward of Wichita won the 1st feature event in 1959 driving a 2.4 Maserati. Grand Prix winners since include some well-known people: Hap Sharp (3 in a row), Enos Wilson, Dave Morgan, Joe Starkey, Alyward again (twice), Bill Jobe and others. Enough nostalgia. Let's check out the course. Turn 1 is a sweeping left-hander just past the S/F line good for well over 100 mph. lt's a wonderful place to get into a real 4 wheel high speed drift if your car is fast enough. Turns 2 and 3 are usually driven as one turn - fast 3rd gear work. Turn 4 brings the moment of truth for braking and downshifting at a 120 degree button hook turn through which there is no fast way. Lots of passing, spin-outs and fender-benders occur here. Turn 5 is a fast 90 degree left, 3rd gear again and you are on the long back chute where you can check your guages and let'er wind out. This is a great place for drafting and sling-shotting the opposition if you can catch a tow. Turn 6 finds you back in 3rd and puts you on a short straight. Up to 4th and then right back to 3rd for Turns 7 and 8, double right-handers which are deceptively fast when you find the line. You pass the hot pit entrance and are on your way past the Starter onto Turn 1. Spectators line the course from Turns 8 to 2 and in a Showroom Stocker you can hear their cheers (you hope!) as you speed by. It is a fast track except for the button hook and looks deceptively simple. The concrete gives great traction even when wet, but tire wear is always a big factor. Having a lot of excited spectators adds to the fun and usually the Governor or Vice Governor of Arkansas is there as honorary race marshal. lt's a show like many SCCA racers seldom see these days - an integral part of the Stuttgart mystique. Another Stuttgart bonus is the famous race party on Saturday night. The lights are low, the music is loud, and you've just got to be there to appreciate it. In years past, you could count on Rosie C. to dance on the tables about 11 p.m. and the fight started about 11:30! That's only nostalgia, as times have changed but the party is still a gasser by any measure. lt's usually held in the American Legion Hall off Main Street. You'll hear the band a couple of blocks away. As mentioned earlier, accommodations in Stuttgart are quite limited and early reservations are a must for hotel space. The Town House Motel on Highway 79 is the newest, Walker Motor Inn is older but comfortable and has a good restaurant. Recommended for Mexican food is the Red Pump Restaurant on Highway 11. End of list! Several fast food places are available tor pizza, chicken and hamburgers. Camping is encouraged at the airport but in a special area adjacent to the race course and paddock site. This past year, (1977) the Arkansas Region transferred its affiliation from Midwest to Southwest Division so it likely won't draw as many of the MIDIV drivers as in the past. I'm betting most ofthe old timers will be there nevertheless. It is more than a race. It is a tradition !